Childcare Business owners & managers know that income minus costs equal profit or financial key performance. This is a pretty simple view of procedures. Understanding what makes up the key performance indicators for financial growth will help a childcare business owner or manager recognise where he or she should concentrate efforts for improvement. Revenues are the monies that the childcare centre takes in for the products & services that are offered. Once the revenues are gathered, then it is time to deduct the costs of the business & calculate the profit. Keeping good records helps with this step. The cost is anything that the childcare centre pays out for operations. This includes employee wages, supplies, insurance, repairs, & advertising. Any debt paid by the business goes into the category of cost. After costs are calculated, deduct from the revenues & what is left is the profit for the business. The financial key performance indicators tell the childcare centre how well it is performing & gives insight into where cuts can be made. Analysing all the costs is an important step that a childcare centre should use frequently. It can be broken down into weekly, monthly & yearly increments. The more frequent the analysis, the better equipped the childcare centre is to spotting trouble areas & fixing the issues involved. Spotting repairable issues & areas where waste can be cut is vital to keeping a centre afloat. Paying attention to the financial key performance indicators helps a business stay viable & avoid going bankrupt. 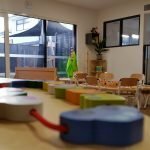 Owning & operating a childcare centre involves vigilance & a desire to see the business succeed. Financial key performance indicators are part of the tools a childcare centre should use faithfully. When these tools are used correctly, childcare centre owners & managers are providing the business with a detailed blueprint for the success of the business. Early Learning Management has been providing professional childcare services for the last 28 years. We have the knowledge; expertise & experience to help you quickly implement value-add systems, allowing your business to achieve its goals & deliver a high level of service. Let us help you grow your business! Our team has invaluable knowledge & visionary industry insight. Unprecedented contribution to the industry through Hutchison’s Child Care Services & Early Learning Services for example. “One Stop Shop” in-house specialised suites. Scalable to meet any dem& & client requirements. Dedicated business development consultant supported by an established team. Delivering a successful predetermined result for our clientele. A robust & experienced “backend” client services team. Outcome, knowledge, timeliness & fairness dictate our value-added solution with a competitive edge.